Gastric Bypass surgery is a very popular bariatric surgery, often considered the “gold standard” in bariatrics. This surgery has many advantages and is seen by surgeons as being a very powerful tool against obesity. This procedure is the safest choice for extremely obese individuals. Gastric bypass surgery is known to help with chronic illnesses like type 2 diabetes and it appears to reduce the risk of cancer. 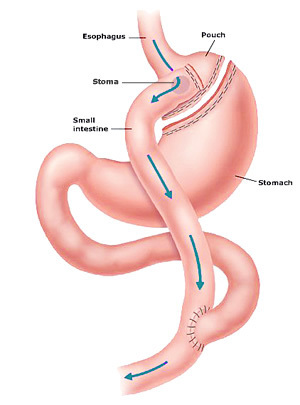 There are two main forms of Gastric Bypass including Roux-en-Y Gastric Bypass and Biliopancreatic Diversion Bypass. Gastric Bypass Surgery works in two key ways: restrictive and malabsorptive. But use two main techniques to achieve weight-loss. First, the surgery creates a small stomach pouch where intake capacity is reduced. Second, they bypass portions of the small intestine to decrease absorption of food nutrients. This two-step approach works well on morbidly obese patients, helping them achieve the most weight-loss in typically one year. Roux-en-Y or RNY Gastric Bypass is the main form of gastric bypass, typically done laparoscopically. RNY gastric bypass does not remove portions of the stomach making it less risky and preferred to Biliopancreatic Diversion. Thus, RNY gastric bypass is the common form of gastric bypass surgery. The average cost of gastric bypass surgery depends on where you have the surgery, hospital and the surgeons. The cost of gastric bypass can range from $20,000 to $35,000. When people choose to have this surgery in another country they can save themselves thousands (Mexico Bariatric Surgery costs about 1/5 to 1/3 the cost of United States). Gastric Bypass surgery has many risks that are serious including death, blood clots in the legs, leaking, pneumonia, and more. Unwanted side effects including dumping syndrome, vomiting, vitamin deficiency, and more. Here are our gastric bypass before and after pictures of past patients!